To be completely honest with you: I'm afraid of heights. Nevertheless, I try to push my limits. I did a bungee jump in Cairns, Australia, for example, and if you take a look on my bucket list than you'll see that a skydive is one of the next things I want to do. 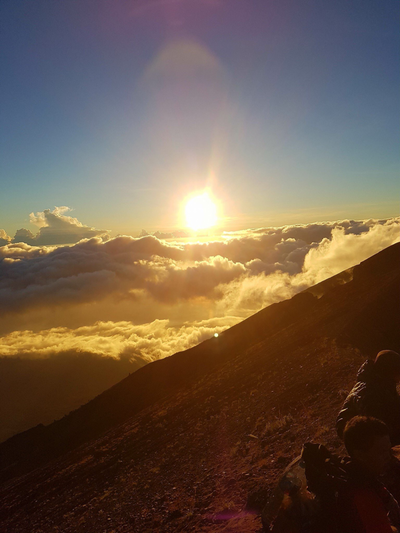 My friends and family know that I'm a hiker, I try to do everything by foot and I came to New Zealand to do a lot of trekking and hiking here. A lot of people told me that Bali is a beautiful place to do some fabulous hikes, especially the hikes up the active volcano seems to be very popular. I don't like popular, I like challenging. 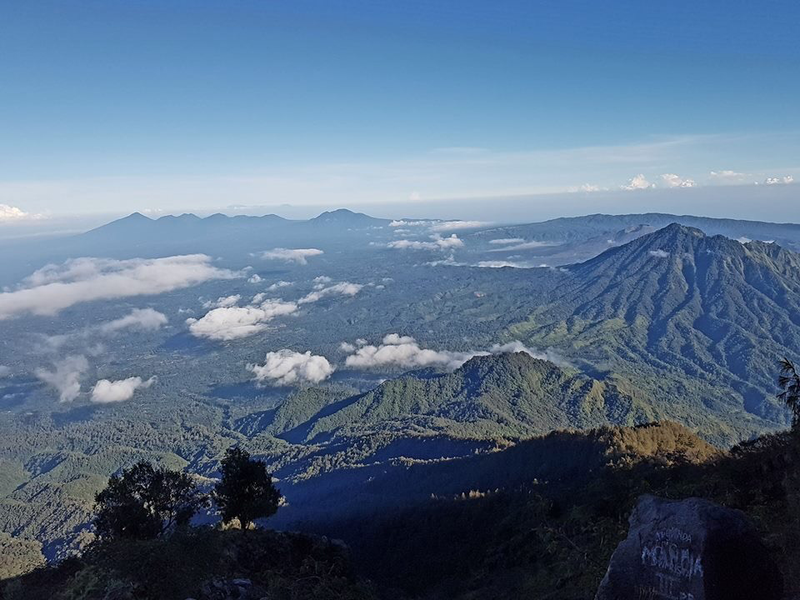 Bali has a few mountains and volcanos to climb on but most of them are pretty difficult to reach the summit. The most popular one is Mount Batur, an active Volcano . The walk is very touristy and easy to book. 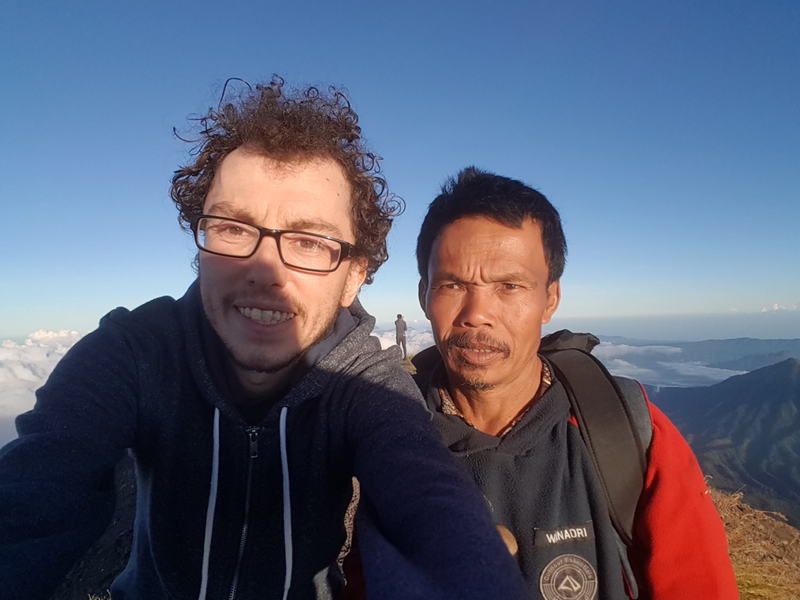 The owner of the home stay told me that you can hike on the biggest and holiest mountain of Bali as well, Mount Agung, but it's a very difficult hike and it takes ages. Difficult and a long hike,… Perfect. But it wasn't that easy to find a company who offered this kind of hike. I finally succeeded after trying for days. I had to be ready at 9pm and they would bring me to the beginning of the track, a beautiful holy temple. I was in a group with 6 others and we were accompanied by 2 guides. An old guy and his nephew,… We got some water, breakfast and some snacks, and we were ready to go. We started walking at midnight and it took a few hours of bush walking until we arrived at a more rough part of the track. I have to mention that they didn't give us any information about the condition of the track. The first few hours were doable but I already knew that coming down would be the worst part. After 4-5 hours was it time for an extra challenge. The bush walk changed in rock climbing. You need to know that none of us was secured, not a bit. I finally arrived at the summit around 6-7am together with the oldest guide. The others came far behind us. 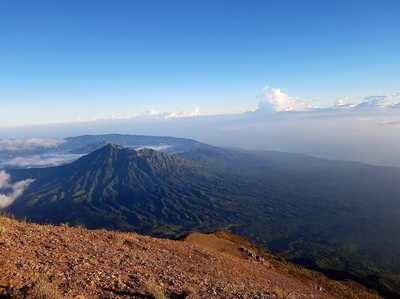 After a coffee break on the highest mountain of Bali, and looking at the beautiful sunrise above the clouds, was it time to climb down again. This moment was one of the most frightening moments I've ever experienced in my life. The combination of climbing down, the height and the lack of safety made me freak out. One wrong step, one moment without concentration and it would have been the end. Yes dear friends, there was a moment I thought I would die. How much I loved the hike and the view, this feeling wasn't worth it. It never will be. I even showed my guide how to access my phone and how to call home if something would happen. I thought about you. All of you. Next time I'll prepare better before I do a walk like this. After all it took 15 hours to do the complete hike/climb, what I didn't expect. They told me that I would be back at the hotel around noon, time enough to catch a taxi to the airport, yes I flew out that night, but now I had to rush. I made it on time. I even had enough time to eat one of the wonderful burgers at the Hard Rock Cafe at the airport. The best burger ever, I deserved it. And a lot of Coca-Cola. Yes I have a coke addiction. Sweaty and full of volcano, but ready for the flight to Brisbane and Auckland.